Newspaper stories involving Brooklyn Beckham are still coming thick and fast, with David and Victoria's eldest son continuing to make headline news for very little reason whatsoever. 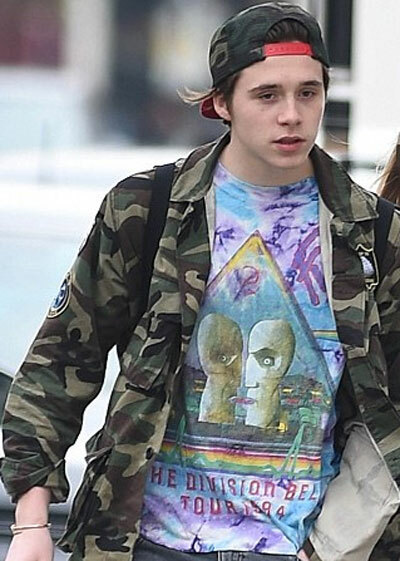 This week in the Brooks-related news, the 17-year-old was spotted walking along a road in London with a gang of friends whilst wearing a very colourful blue and purple Pink Floyd, tie-dyed T-shirt, with the words 'The Division Tour 1994' written at the bottom. Brooklyn was also wearing his new army camouflage jacket again, as well as his Adidas cap, although this time, his cap was turned backwards, in a typical skateboarder fashion. The girl walking next to the teenager was spotted with a large Burberry scarf around her shoulders, clearly supporting the Beckham family's strong links with the Burberry brand. The controversy regarding Brooklyn Beckham being recently chosen as a photographer for a Burberry's fashion shoot continues, thanks to his dad David chipping in this week and lashing out of critics. David shot down any claims of nepotism, supporting his son's photographic skills by simply saying 'He's got a great eye-and proven that in the images he's taken'.